Not a day goes by when we don’t talk about the ‘digital talent gap’ in the world of marketing. To help empower the next generation of business leaders by developing their skillsets and a digital mindset, Google is relaunching its digital training programme Squared from 7-25 September. 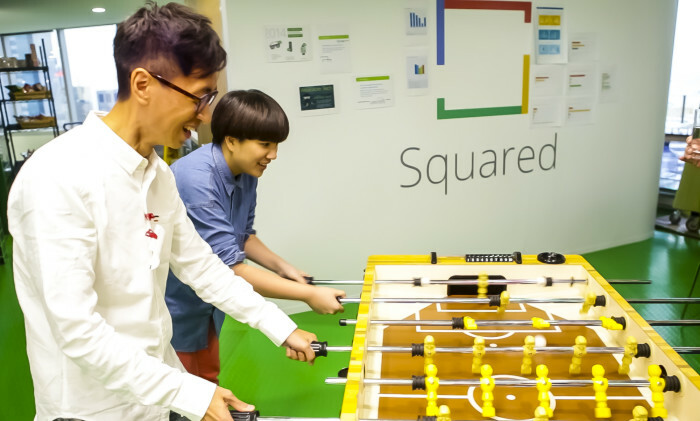 First debuted in Hong Kong last year, Squared is a Google-led initiative, developed specifically for individuals from the marketing and advertising industry with five to eight years experience, who have been identified by their senior management as having high leadership potential within their organisations. This year, 31 participants from a wide variety of local and international advertisers, media agencies and creative agencies joining the digital education programme. On top of local participants, Squared also got a candidate flying in from Taiwan to join. Participating brands include L’Oreal, Nestle, Swire, Clarins, Hutchinson, Reckitt Benckiser and Citibank to name a few. Among the participating agencies are Publicis, DDB, MediaCom, Grey Worldwide, Starcom, DAN and more. Meanwhile, external speakers, guests and judges include Sue McCusker, CEO of Publicis Hong Kong, Bradley Young, head of mobile of Omnicom Hong Kong, Ricky Wong, CEO of HKTV and Phyllis Ma, regional digital and brand marketing manager at Hasbro. The 12-day programme will support participants to realise the benefits and importance of working through digital channels but also to re-think their approach to learning, handling changes and how to become members of creative and efficient teams. Squared will be delivered by the guest speakers and thought leaders of the industry as well as mentors and digital experts from Google. The course is composed of three modules while the teams will be working with HKTV on this year’s final project focusing on driving online business for HKTV Mall in the third module. The first module, led by Impact International, lays a base by letting participants understand their own personal leadership style and how they can leverage different tools and experiences in activities to work together as a team. The second module is made up of three projects where the participants will have to collaborate in smaller teams to develop and present successful solutions to given challenges. Each project will also have a different focus from developing an understanding of growing businesses on and offline to more specific topics such as mobile, social and video. The participants will work on their final project in the third module. This project focuses on helping the HKTV Mall site sustain an always-on traffic and business, by making suggestions on optimising their media allocation, improving digital marketing activity from previous campaigns. They will also share their experiences, reflect back and form their plans for moving forward. Last year, there are 22 graduates from the inaugural Squared programme. The participants will go back to their business to practice their new skills in a real context, they will also become the global Squared Alumni, and establish their personal development plan. The Squared alumni network will meet again in a few months time, as part of the Squared platform to foster on-going networking and communication across different years of Squared cohort. Squared programme runs until 25 September. LOOK Will Maurice Lévy actually "work" for this agency? Meanwhile, the Communications and Multimedia Ministry also welcomed suggestions and ideas from citizens on ways to liven up the Na..
Women in Malaysia trust the media more as compared to men. Meanwhile, the level of trust in the media for both Singaporean men and..
WPP’s Xaxis became the first APAC agency to use comScore-The Trade Desk integration platform to measure digital campaign performan..